This is the tutorial on how to set up your pfSense device with VPN.Express. The instructions were made for connection to the South Africa #1 (za1) server with pfSense 2.2.3. Special thanks to slvR for providing these instructions. 1. Download the latest CA certificates from this link and extract the package. 2. 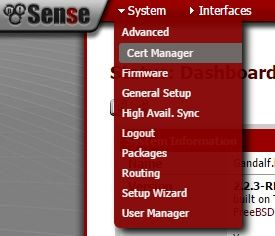 Open the pfSense WebUI and go to System -> Cert Manager. 4. Now go to VPN and select OpenVPN from the drop-down menu. Disable this client: leave unchecked. Description: Any name you like. In our case it was VPNEXPRESS. 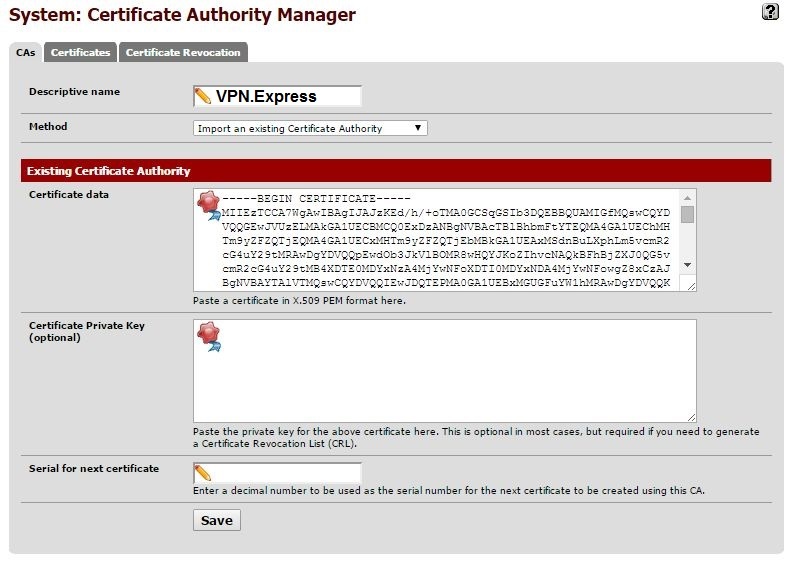 User name/pass: Your VPN.EXPRESS username / your vpnexpress password. Hardware crypto: No hardware crypto acceleration. Don’t add/remove routes: leave unchecked. 6. Go to Interface and select assign drop the drop-down list. Then click on the + button. A new interface will be created. Name it VPN.EXPRESS_UK for instance. Also, change the interface port to ovpncX where X is the number of the interface you have created. Usually it will be 1. Save changes. 7. 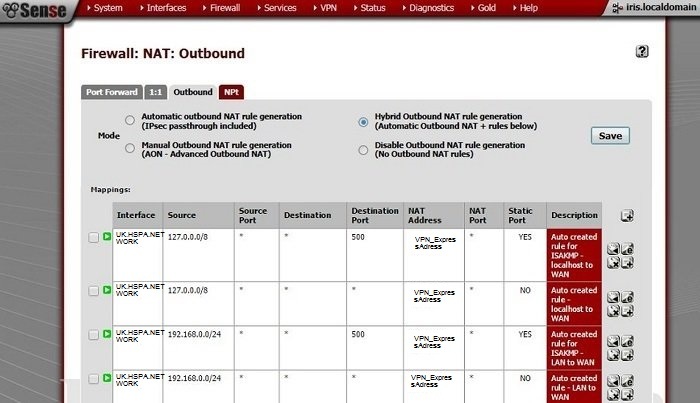 Now go to Firewall -> NAT -> Outbound. 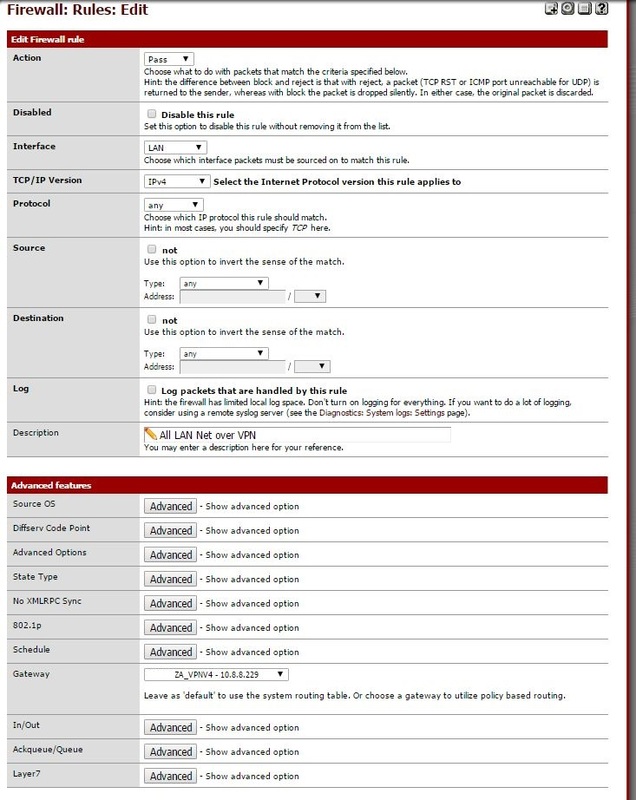 For the outbound rule mode select Hybrid outbound NAT rule generation (Automatic outbound NAT + rules below). You will now need to copy Mappings listed and change Interface to VPN.EXPRESS_ZA) (or whatever other name you have used in the previous step). You should now see something like in the picture below. Gateway: Type: Interface that we have created (in our case it is VPN.EXPRESS_ZA). Click Save and then Apply the changes to the firewall settings. That’s it! You should now have the VPN connection set on your pfSense.